What's in a Zipper? - Deb Arnold, Ink. 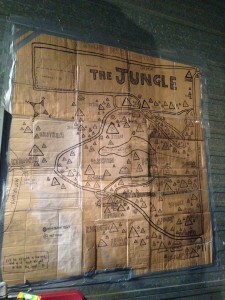 Map of the Jungle, settled by country of origin. I’m not a humanitarian aid worker. I don’t work for the Red Cross or the UN. And yet I and Joe Schmoes like me are the ones on the front lines of the European refugee crisis. It’s a sad, sad state of affairs on so many levels. When Greek Islanders are nominated for a Nobel Peace Prize for their work rescuing migrants from sinking boats, there is something very wrong with the world. Why housewives and fishermen and not armies and governments? In December 2015 I spent a week in Calais, on France’s northern coast. With a ferry port to Dover and a nearby Eurotunnel entrance, it has attracted several thousand migrants hoping to seek asylum in the UK. They want to join family or friends there, and/or speak English, or just believe (true or not) that the UK will give them the best shot at a new life. Unfortunately, the UK and French governments have responded with a fairly single-minded effort: keep them out. So about 5,000 people (mostly men either without families or who plan to send for their families after getting settled) are living in a muddy field. They are mainly from Sudan and Eritrea but also Ethiopia, Afghanistan, Pakistan, Iran, Iraq, and, more recently, Syria. Conditions in “the Jungle,” as residents have named it, were so bad that in November several non-profits sued the French government to make improvements such as more water access points and toilets (one for every 20 people, the standard, vs. one for every 75, the reality then). They won. Who’s keeping the residents clothed, fed and sheltered? Makeshift kitchen run by chefs from London. With four other kitchens they try to feed all residents at least one hot meal a day. Small non-profits and grassroots efforts similar to those that have sprung up across Europe to fill the vacuum left by those in charge. 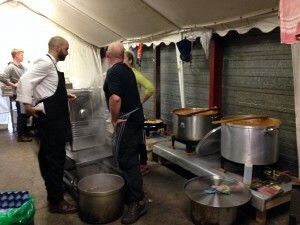 Care4Calais, Calais Kitchens and Caravans for Calais are just a few of the mostly UK-based groups doing absolutely incredible work. 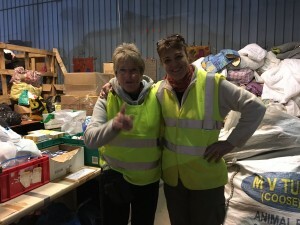 I volunteered with a joint effort of UK-based Help Refugees and French L’Auberge D’Migrants, based in a large warehouse that accepts, sorts and distributes donations. Mountains of donations. Clothing, bedding, tents, sheets, blankets, sleeping bags, towels, toiletries, medicine, toys, shoes, tarps, food – you name it. It is a monumental effort run entirely by volunteers. My contribution to the refugee crisis? Sorting clothes, which is both more important and more satisfying than it may sound. Note that I was promoted to manager on Day 2 – which means I have a modicum of common sense and am willing to tell people what to do. Here’s where the zippers come in. When the young woman in charge of the warehouse briefed my group and me on how to sort through the bags and boxes and suitcases of clothing, she spoke emphatically about checking the zippers. “We are here to try to protect the dignity of the refugees,” she said in her loud, clear voice. Imagine you’ve left behind everything you had and knew, possibly running for your life. You are living in terrible conditions and must rely on others for daily survival. French riot police and right-wing townies threaten or perpetrate violence regularly. You stand on line for an hour during “pants distribution day.” You take your donated pants back to your tent or rough shelter, put them on…and the zipper doesn’t work. When it was my turn to “train” the new volunteers (who arrived throughout the day), I implored them: “a broken zipper is a broken heart.” And Lord, if there’s anything I don’t want to do, it’s further break the heart of someone in that hellhole. The local French government has, in stages, been evacuating areas of the Jungle. Surely they believe that if the migrants move elsewhere, then the problem will go away. Or at least it will go away from them. My experiences in Calais exposed me to the worst and the best of humanity. The suffering of innocent people, the indifference and callousness toward the suffering, the xenophobia, the hatred and hard-heartedness – it is overwhelming. A mother-daughter dynamic duo who drove a van full of donations to Calais from their home in Scotland. But I’ve also been moved to tears by the beautiful generosity, goodness and selflessness shown by the volunteers in Calais, throughout Europe and yes, by the housewives and fisherman of Lesbos and other Greek Islands. I was awed by the resilience of the Jungle residents who opened shops and restaurants, a school, an outdoor art garden, churches and mosques (Sunni and Shiite, right across from each other with no conflict) with only their ingenuity and perseverance. I grow more distressed and concerned as time marches on and no real solutions are even being discussed by the leaders whose continent has been inundated with more than one million migrants in 2015 alone. I wish I could sound an optimistic note. I cannot. I can only ask that you look inside your heart and ask what you might do to alleviate suffering in the world, regardless of where or who or how or how much. Just take action. Don’t wait. You don’t have to travel to Calais to make a difference – just do something. This final video sums it up: there is so much more to do. *Deb Arnold, Ink reserves the right to restrict comments that do not contribute constructively to the conversation at hand, contain profanity, personal attacks or seek to promote a personal or unrelated business.